This is a comparison of Nest Cam and Ecobee. So you are looking for the best thermostat for the money? If so, you must have come across Ecobee and Nest. Factoring in performance, reliability and value, these two thermostats are among the best in the market. But which one should you buy? Ecobee or Nest? In our comprehensive Ecobee vs Nest comparison guide, we will be looking at two of the industry’s best thermostats, outlining the differences, similarities, pros and cons in each of them with the intention of helping you make an informed decision on which one to buy. Our comparison guide is based on the research and first hand experience with the use of these thermostats. If you need our straightforward answer to the Ecobee vs Nest, we found Nest to have the upper hand in most factors. Why? Better and consistent performance, better energy saving and excellent customer support. Also based on customer satisfaction and ratings, Nest thermostat beats the Ecobee thermostat by a huge margin. Here is our detailed comparison on the two thermostats. Ecobee3 Lite – This is the earlier variant of Ecobee thermostat which has less features and cheaper than the other versions of the same brand. It is a smart thermostat that also integrates with Alexa. Ecobee3 – This is the second generation Ecobee thermostat and comes with Sensor, Wi-Fi, 2nd Generation and works with Amazon Alexa. Ecobee4 – This is the latest model by Ecobee and it comes with a sensor, Wi-Fi, and comes with built-in Amazon Alexa system. Of the three variants, Ecobee 3 remains the preferred model and one that you can always count on for the best performance and reliability. We will also be basing our Ecobee vs Nest comparison guide on the Ecobee3. Check the best price on Ecobee3 here. As with Nest, there aren’t any different variants. The only thing you will notice with Nest thermostat system is that there are different styling which determine the pricing (although the pricing difference is minimal). You get to choose between Black, Copper, Stainless steel and White. Below are more detailed reviews and comparison of the Ecobee vs Nest thermostats, highlighting every factor to help you pick the best of the two thermostats. Thermostat installation is something that could make a huge difference in deciding whether to invest on one or not. You surely wouldn’t want to spend hours trying to install and set up a thermostat. First thing you need to keep in mind when installing any electrical system, is to kill the power. Then you need to follow the installation instructions on the thermostat box. As with the case of Ecobee and Nest, they are fairly simple to install and you will be done in minutes. Here are the steps for installing the Ecobee thermostat in your home. Kill the power to the thermostat. Be sure to label the wires to make your installation easier. For better understanding, you have the Ecobee installation manual. You can also check out the video below for a detailed guide on this. Kill the power to your thermostat. Carefully label the wires to your old thermostat for easy installation. Now, disconnect and remove your old thermostat. Ensure that the Nest base plate is level and well positioned. Although optional, you can install the trim plate. Using screws, mount the Nest base to the wall. Connect the wires you labeled to the Nest thermostat. Next, you should attach the thermostat display. Plug in the power and switch on the thermostat. Connect the thermostat to your home Wi-Fi network. Download and install the Nest mobile app. Follow the on-screen setup and configuration commands. The nest thermostat will then start learning the lifestyle of your family and various usage of devices and home surroundings. Here is a video showing Nest thermostat installation. Nest thermostat can be installed within 30 minutes. Although we had a record time with Ecobee and installed the Ecobee3 in 28 minutes, the installation time difference inst really that much, so it would be advisable not to use the installation factor as the final deciding factor. (If you are new to these kind of installations it could take you more time, so it could take you up to an hour). It is worth noting that the Ecobee system requires a C wire for the power option while the Nest thermostat comes with a lithium-ion battery as well as a C wire power option. The design, interface and special features that makes a thermostat are crucial and determines the performance, reliability and the quality of service you will get from it. Below, we point out the features and what you get from both the Ecobee and Nest thermostat systems. Ecobee at a glance: what makes it stand out? Works with Alexa – Ecobee intgrates and works well with the Alexa system, although with the Ecobee Lite and Ecobee3, you need to buy the device separately, the Ecobee4 which is the latest model has Alexa built into it. Uses a smart system – With Ecobee, you kind of train it based on your profile and home configurations and it is smart enough to monitor your home energy profile, weather, temperature control among other factors to ensure that you enjoy every moment at home. Cut down your energy bills – It is always a concern for everyone to cut down those crazy energy bills. Ecobee thermostat has proven to be a good investment in slashing down those bills through its smart system. Many people have also confirmed saving more on energy by using the Ecobee thermostat. Performance inconsistencies – It is always important to have a reliable thermostat in place. Reliability with Ecobee could end up being an issue. Many of the customers have complained about an issue to do with performance of the Ecobee. and most of the critics confirm the system to work well at first, only to start misbehaving or performing poorly. Poor customer service: Having good post-sale customer support is very important, as you could have a specific issue with the system or malfunction. There has been a notably high complain with the customer support from Ecobee. We haven’t had any issue ourselves with Ecobee which made us call the customer support, but we gathered a handful number of negative reviews from leading online outlets noting their disappointment with the customer support. Nest thermostat: what makes it so unique? Nest thermostat is arguably the best selling thermostat in the market. Factoring in the fact that it has sold more than three times all of Ecobee variants combined (based on findings from major online outlets), it surely is something worth digging into. Integrates well with Alexa – Want to speak to your thermostat? no problem. If you need voice control over the Nest thermostat, then you’ll love the fact that it works well with Alexa. Optional power – Having more power options on a thermostat means that you get to choose the right one for your home or switch whenever you feel the need to. Nest offers two power options: The use of the C wire and the rechargeable battery option which gives you a good edge. Advanced energy saving feature: Nest cam boats having a third generation thermostat which is unique than any other in the market. Nest is a learning thermostat which means that the thermostat will monitor your day to day lifestyle and usage of devices in your home and then adapt the perfect schedule and ensure that the devices and appliances only run when needed. It is obvious that we always waste a lot of energy when there are lots of devices running without the need to have them on. Nest offers that hands-free ability to save energy whether at home or away. 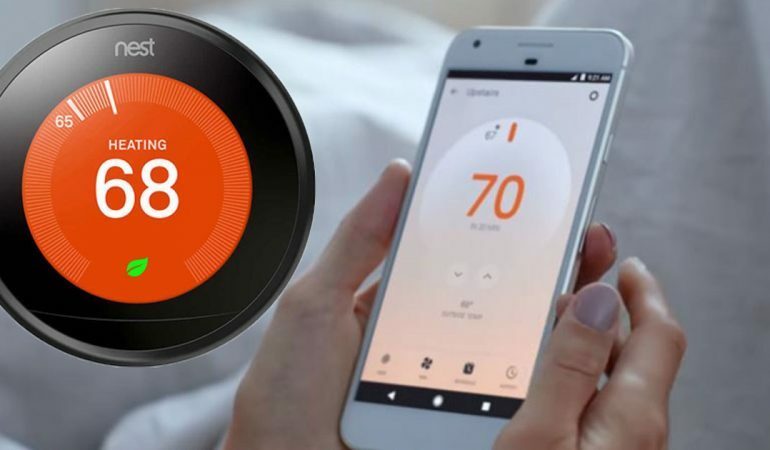 Farsight feature – The Nest thermostat has something new to thermostats and you will find it useful in many instances. The Farsight feature which lets you “READ THE DISPLAY FROM ACROSS THE ROOM” will come in handy if you would like to know whats going on the thermostat display even if you are on the next room of your home. You have the option to choose the analog or digital clock display for this. A variety of colors and design styles – Nest learning thermostat comes in a number of design and colors to perfectly blend with your home. So whether you have a modern home design or a vintage one, you can find a thermostat that fits well. If you are design and decor conscious and would love a thermostat that fits well with your wall, then you can choose from either Copper, Stainless Steel, Black, and White. Works with NEST devices – If you already have a NEST system in your home, then you will love the fact that the NEST thermostat works well with those other devices. If you therefore want to control the Nest camera surveillance system, you can easily integrate the Nest thermostat. Besides communicating with Nest devices, other appliances such as smart washer, dryer and laundry systems making it an incredible thermostat. All you need to know if a system works with this thermostat is to look for the “Works with Nest” badge and you are good to go. Works with most home systems – The Nest Learning Thermostat has been designed to integrate and work well with home devices and systems of 24V. these includes heating and cooling systems, electric, forced air ,gas, radiant, oil, heat pump hot water, solar and geothermal systems. Like Ecobee, Nest too isn’t perfect. Here are some cons with Nest. Battery having issues – It is such a nice idea to have two power options on a thermostat, something that isn’t seen on other thermostat brands, but Nest ought to do something about the battery option. Of the verified customers who had complains about Nest, a majority were opting to switch to using C wire power option rather than the rechargeable batteries. It’s a good thing that they have both anyway. With the battery concern, we recommend you use the C wire power option if you choose to buy the Nest thermostat. One of the main reasons why people consider getting a smart thermostat is for the sole purpose of helping to cut down on energy usage at home. Ecobee promises to save up to 23% of energy and from research and analysis gathered from hundreds of reviews, the Ecobee3 has shown impressive savings of between 14% to 21% (the variation depends on your home usage and could vary on how much time you spend at home on a particular month). Similarly, the Nest thermostat has shown outstanding performance and even proven to better for other folks when compared to Ecobee thermostats. Nest thermostat’s energy saving ranges from 15% to an impressive 24%, thanks to the learning feature that isn’t seen in other thermostats. Both of these thermostats are good energy savers, but the Nest’s learning system seems to be offer something more incredible that helps to dramatically cut down energy consumption. For energy saving, Nest thermostat wins the bout. Although different brands have their own unique designs, there are features and factors that will always work similarly. Below are some of the things that are similar between Ecobee and Nest thermostats. -First off, these thermostats are both easy to install, setup and run in your home. -Mobile apps accessibility – both Ecobee and Nest thermostats can be easily controlled using applications on your phone, tablets and computer. -Both of these thermostats can control your HVAC systems adjusting the temperature according to your desires. Whether home or not. -To save energy, both the Nest and Ecobee thermostats have the functionality to allow air only cooling to save energy. -These thermostat systems can be linked to fiuntion with other smart home devices such as Amazon’s Alexa, IFTT, Smartthings, Wink among others. -Both Nest and Ecobee thermostats have good statistical analytic system which enables you to see the energy savings report and you can also make adjustments to save energy as you wish. -These thermostats have sensors which works in ensuring that all the linked devices works as they should to regulate temperature, humidity, home occupancy among other things. So what sets these thermostats apart from each other? What makes Nest thermostat different from Ecobee? Here are some of the most notable differences on both. -Powering Nest thermostat can be by a C wire or with a rechargeable Lithium-ion battery that comes with it, unlike the Ecobee which is only powered using a hardwire only. -Nest thermostat has a 480×480 24-bit LCD screen while Ecobee has a lower resolution display screen of 320×480. -Ecobee thermostat has a wireless room sensor while the Nest thermostat lacks this feature. -The Nest thermostat learns and studies your behavior and adjusts itself to your lifestyle and you can also input your own settings while on the other hand Ecobee only relies on your own settings which comes as a big drawback here. -Ecobee thermostat supports usage with Apple Homekit while Nest does not. Nest thermostat has better wireless connectivity with 2.4 or 5 gigahertz bands as compared to the Ecobee4 which uses only the 2.4 gigahertz band. -Nest comes with a“sunblock” feature which helps adjust the temperature when it detects the sun while the Ecobee thermostat lacks this feature. -On top of the Home and Away mode that is available in both thermostats, Ecobee (particularly the Ecobee4) has a Follow Me mode which the Nest thermost does not have. -The Ecobee thermostat uses a touch screen control interface while the Nest has a dial to control display control interface. -Nest works with Google Home natively while with Ecobee thermostat, third-party apps are required to use the Google Home. -The Nest Farsight Display functionality enables the user to access the customizable screen upon detecting you are nearby but the Ecobee thermostat does not have this functionality. -Although earlier versions of Ecobee (i.e Ecobee3 Lite and Ecobee 3) did not have a built in Alexa functionality, Ecobee4 has it. Nest doesn’t have it as a built in feature also but works with Alexa. Below is a table detailing various features and factors of both Nest and Ecobee thermostats. What’s In the box Comes with a Display, Base, Screwdriver, Start Here Manual Installation Manual mounting kit, mounting screws & labels for easy installation. Comes with a remote Sensor, detachable stand, Standard/ large trim plates, Power Extender Kit, Screws and drywall plugs, Start Here Manual, Installation Manual and labels for easy installation. Remote control Yes. Also has a Farsight feature that allows access from across the next room. Comes with a good remote control. App interface Uses both phone apps and computer apps. Uses both phone apps and computer apps. Wireless connectivity Nest comes with a sharp 2.4 or 5 gigahertz capability. Ecobee comes with a 2.4 gigahertz wireless connectivity. Which one to buy? Ecobee or Nest? Since, we’ve seen that there are differences between the two thermostats, here is our recommendation on which of the two you should put your money on. >If you need a thermostat that gives you multiple power options. You can power Nest using both a C wire and a rechargeable battery while Ecobee can only be powered with a wire. >If you need a thermostat that automatically learns your behavior. Only Nest thermostat can do this while Ecobee doesn’t learn but rather relies on your own settings. >If you need a thermostat with better wireless connectivity. >If you need higher and better resolution. > If you need a thermostat with more features and better control. >If you use Apple home Kit. Only Ecobee supports the Apple home kit and Nest does not support it. Final verdict: the final decision depends with you, but clearly the features and functionality that you get with Nest thermostat makes it more superior than any of the Ecobee thermostat variants. With the many customer reviews and high rate of satisfaction, you’d also be better off with Nest. There isn’t much difference in pricing but Nest is slightly cheaper.